Major western media headlines in recent days have hailed the capture of major natural gas fields around Syria’s Deir Ez Zor province as though it were a victory for Syria. Typical headlines read, “SDF Recaptures Syria Gas Field From ISIS.” Note the word “recaptures,” implying that the original owners of the gas fields, the Syrian state, had managed to recapture its valuable economic resources from ISIS terrorists. In reality, the opposite is the case. Behind that portrayal is the ugly truth that US Pentagon forces have been exposed as the guiding hand for both the ISIS terror group and for the SDF. ISIS had occupied Dier Ez Zor province and its oil and gas fields since 2014, robbing the Assad government of one of its main sources of income and of energy. On September 24, the Russian The Russian Ministry of Defense released aerial images showing US Army Special Forces equipment where ISIS militants are deployed north of the city of Deir ez-Zor. The pictures show US Army units providing free passage for the predominantly Kurdish Syrian Democratic Forces (SDF), allowing them to pass through the battle formations of Islamic State terrorists, the Russian ministry said in a statement. 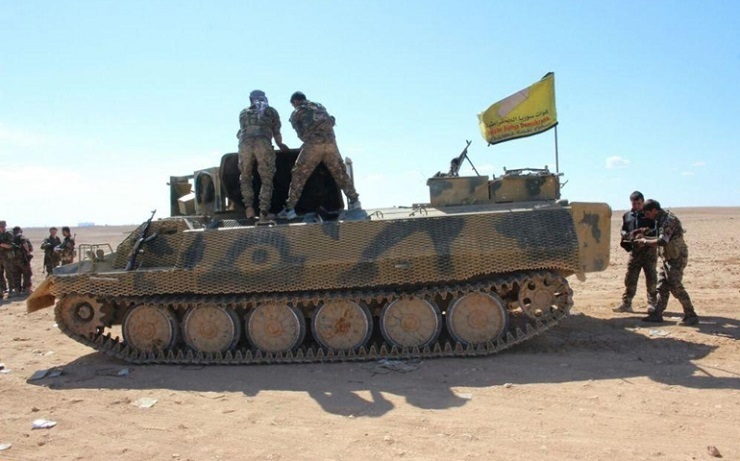 “Without resistance from ISIS militants, the SDF troops are moving along the left bank of the Euphrates river towards the town of Deir ez-Zor,” the statement reads. The Moscow Defense Ministry statement goes further, “Despite the strongholds of the US armed forces being located where ISIS troops are currently deployed, there are not even signs of the organization of a battle outpost.” Obviously, the US military personnel in the middle of ISIS controlled territory feel absolutely safe in the area. Now the long-term Pentagon plan, first outlined in a 2006 US Armed Forces Journal piece, for a US-and-Israel-backed independent Kurdistan state carved out of territory of Iraq, Syria and even NATO-member Turkey and ultimately, Iran as well, is emerging into the sunlight. Until now it has largely been hidden in the darkness of more than six years of a US-sponsored and mainly Saudi-financed war to depose the legitimate elected government of Bashar al Assad, a prime obstacle to the planned balkanization of the region. War against Terror or War with help of Terror? The Pentagon lie that Washington has been fighting a war in Syria to destroy ISIS terrorists —a US aggression, by the way, illegal under international law as it is hostile invasion of a sovereign country against the UN Charter—is now fully exposed as just that, a lie. The Pentagon and CIA and its various killer-for-hire private mercenaries, as has been charged many times, created ISIS out of its Al Qaeda in Iraq and Syria in an attempt to topple Assad and take control of strategic oil and gas reserves and pipeline routes. At stake is the energy future of not only Syria but potentially of the European Union and of Asia. This is no spur-of-the-moment idea of General ‘Mad Dog’ Mattis’ Pentagon to use Syrian Kurds to gain control of key energy corridors in Syria after their other options failed. The plan goes back at least to a 2006 article published in the US Armed Forces Journal by Colonel Ralph Peters. There Peters outlined a plan for radical redrawing of the post-World War I borders of the entire Middle East. In his piece, Peters argues, “A Free Kurdistan, stretching from Diyarbakir through Tabriz, would be the most pro-Western state between Bulgaria and Japan.” He goes on to claim, “The most glaring injustice in the notoriously unjust lands between the Balkan Mountains and the Himalayas is the absence of an independent Kurdish state. There are between 27 million and 36 million Kurds living in contiguous regions in the Middle East.” Peters even spoke of a probable independence referendum by the Iraqi Kurds in which “Nearly 100 percent of Iraq’s Kurds would vote for independence.” It just took place, and the Soviet-style results were 92%, with reports of severe intimidation of voters voting no from the Barzani clan thugs, as in “vote yes or else.” Barzani himself has amassed a fortune reported in several billions through corrupt practices he runs through family members. Since 2015 he has ruled as president with no legal mandate after the National Assembly demanded his departure. This past summer before the Hamburg G20 summit, the US President announced he was cutting funding for the CIA and Pentagon war against jihadi terror in Syria and the Middle East. What now becomes clear is that instead of training what in fact were ISIS and other terrorists and sending them to battle Assad, a battle the Jihadi mercenaries were badly losing once Russia engaged in September, 2015, the US funds were being shifted to Kurdish military brigades of the so-called Syrian Democratic Forces (SDF). After Trump’s announcement, huge shipments of US-supplied weapons were sent to the Kurdish SDF, including heavy machine guns, mortars, anti-tank weapons, armored cars and engineering equipment. This past May Trump signed authorization to arm the Kurd SDF militias. By June some 348 trucks with military assistance had been passed to the group, the Turkish Anadolu news wire reported. According to the news agency’s data, the Pentagon’s list of weapons to be delivered to the group includes 12,000 Kalashnikov rifles, 6,000 machine guns, 3,000 grenade launchers and around 1,000 anti-tank weapons of Russian or US origin. Now it’s clear those US arms shipments to the Kurd SDF forces was aimed at a new war against the Damascus Syrian Arab Army of Bashar al Assad, a war to prevent Assad’s troops from retaking their rich oil and gas lands around of Deir ez-Zor. In early September the forces of Assad’s army, backed by Hezbollah and Russian air cover, finally broke a three-year ISIS siege of the vital city of Deir ez-Zor, the heart of Syrian oil and gas reserves. At the same time the US-backed and now heavily-US-armed Kurd SDF captured the rich gas fields north of Deir ez-Zor. US Special Presidential Envoy for the Global Coalition to Counter ISIL (ISIS/IS/Daesh), Brett H. McGurk, met on August 18 with local tribal leaders who earlier had been apparently bribed to pledge allegiance to ISIS. Now they are reportedly following the money and changing to back the US Kurd SDF forces against the same Assad. Most recently the US set up a former ISIS terror fighter, Ahmad Abu Khawla, to be commander of their newly-created Deir Ez Zor Military Council controlled by the US Special Forces. Abu Khawla is a convicted car thief, extortionist and all-round thug. From ISIS to SDF no matter, so long as the money flows. But because of the recent success of the Syrian Arab Army and allied forces backed by Russian air power, the battle is turning into a direct US-Russia showdown, something in no way conducive to world peace. As repeatedly in their history, the Kurds of Syria and of Iraq are being played by the larger powers in the west for their own game: to totally control the vast energy resources of the entire Middle East and with it, of much of the world. Ultimately the game will fail, though not before senseless and inhuman slaughter continues to take its toll.